Apple is set to report its earnings results for the second quarter of its 2018 fiscal year at 1:30 p.m. Pacific Time today. The quarter began December 31, 2017 and ended March 31, 2018, according to Apple's fiscal year accounting calendar. 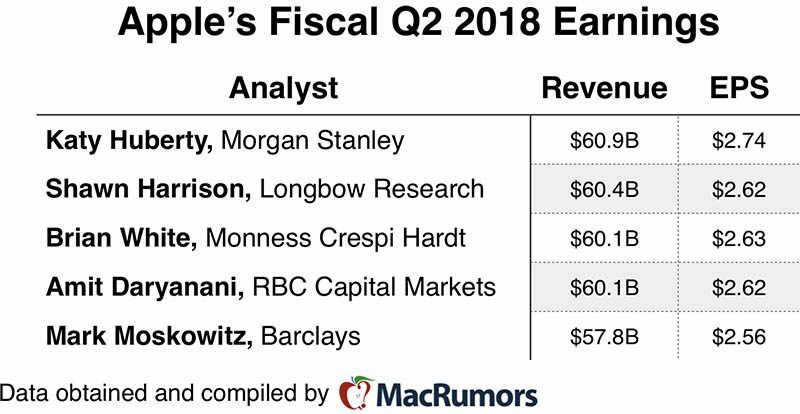 Wall Street analysts forecast that Apple will report $60.9 billion revenue, meeting roughly the midpoint of its guidance, and earnings per share of $2.69, according to over 30 estimates averaged by Yahoo Finance. Apple is expected to report iPhone unit sales of 51.9 million, a roughly two percent increase over 50.8 million in the year-ago quarter, according to average analyst estimates compiled by Bloomberg. Apple doesn't break out iPhone sales on a model-by-model basis, but the iPhone's average selling price should reveal whether there's any truth to reports that iPhone X sales have slowed significantly. iPhone ASP was $796 last quarter, up from $695 a year earlier. Of increasing importance is continued growth of Apple's services category, including the App Store, Apple Music, iCloud, iTunes, Apple Pay, and AppleCare. The average analyst estimate is around $8.3 billion, according to Gene Munster, up from $7.04 billion in the year-ago quarter. With increasing competition from Huawei, Vivo, and Oppo, Apple's performance in Greater China will be a focus. Apple reported revenue of $10.4 billion in the region in the year-ago quarter. Apple said it would provide an update on its capital return program during today's conference call, and many analysts expect significant increases, given the company's plans to repatriate an estimated $250+ billion in overseas cash under new tax laws in the United States. Apple's third quarter guidance will set expectations for April-June, which has historically been the slowest period of the company's fiscal year. The average revenue estimate is currently $52.04 billion, according to Yahoo Finance, which would top $45.4 billion in the year-ago quarter. Apple's CEO Tim Cook and CFO Luca Maestri will discuss the company's earnings results on a conference call at 2:00 p.m. Pacific Time today. MacRumors will loosely transcribe the one-hour call as it happens. I really hope Apple can pull through, I like to root for the underdogs. I’ve never seen another company that generates so much noise around earnings. Every quarter Wall Street is in a panic about Apple. And it’s always that the next quarter is going to be bad. So last earnings call Wall Street was panicked about the March quarter. Now they’re panicked about June. And two months from now they’ll be panicked about September. What other company (tech or not) continuously has Wall Street panicked the way Apple does. I can’t think of one. Hope everyone is ready to see Apple is doing quite well. I’m neither ready nor unready. They aren’t giving me any of those billions. I also don’t own any of their stock. I’m just the idle curious up in the peanut gallery. What the actual SNAP?! Can I call Google that, too? It's not 1990 for Apple. It's not 2001 for Google. If anyone really see Apple as the little guy shoving elbows just to get a seat on the big bus is astonishing, seeing history unfold as it has. You have to look at trajectory, not position. Apple today is what Blackberry was in 2007. Amazing at what they did and the de facto standard among wide swaths of society. But also camping on ten-year-old ideas with no significant game changers in the R&D pipeline. If you were at Blackberry in 2008 you would be reveling in the greatest balance sheet in the company's history...and in dominating your market space! What you would not realize and what Apple does not realize is that the old ideas can't carry you forever. And in case you don't think that the comparison is fair, remember that Blackberry at it's peak was #1 in the smartphone market. Apple is currently #2 and declining. Meanwhile, every world-changing paradigm at Apple was developed by Steve Jobs. Since then, they have invented dongles and baubles and earphones and a speaker that no one bought. And a watch that didn't really take off. So yes, it's 1990 again for Apple. They just don't know it yet. I hope the X gets priced down because $1000 USD is too much for a marginal upgraded smartphone. TSMC already reported they have excess iPhone X parts because Apple stopped ordering them. You should buy some of the company. They are going to give many billions back today when they update their capital return program. Don't read headlines to form your opinion. The TSMC results were not nearly as bad in general and for Apple as reported. It's very difficult to use reports of other companies to infer anything about Apple. Proven time and time again. Thanks Homepod for filling the gap!!??? I hope there is a huge drop in sales and the shares fall considerably. I’m a customer not a shareholder and I want Cook to focus more on pleasing his customers and less on pleasing his shareholders.